The route that we will do on the cruise in the North Dodecanese islands will be very quiet because the wind is not as strong as in the Cyclades and because the islands are very close to each other. We will leave from Kos with the wind against a small stretch until you reach Kefalos to enjoy swimming in crystal clear waters and and in the afternoon our route will be to the port of Kalymnos, the island of sponge weighers, where we will sleep. The next stages include a stop at Leros, a magnificent island beloved by the Italians and we will sleep in the beautiful bay of the castle, then further north in the uninhabited island of Arkangelos and then we will arrive in Lipsi. Our cruise will continue to the island of Patmos that deserves to be visited for a couple of days. The return to Kos, always with a nice stern wind, provides a stop at the islet of Pserimos where we spend the night in the bay and then we will end again in Kos. Honestly Kos is perhaps the least beautiful but very convenient island for its international airport. From the plane you will be in a boat in just 15 minutes by taxi. We will leave from Kos and we will stop in Kefalos for beautiful baths in a white sand bay. In the afternoon we will leave for the wild Kalymnos. 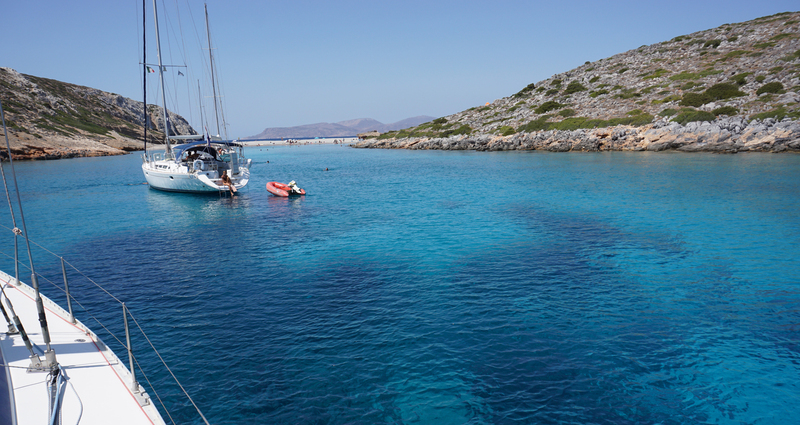 Kalymnos is called “The Sponge Fishers Island”. The scenery is wild and dramatic with high rocky mountains descending towards the sea. Among many beautiful beaches and uncrowded bays on the North-East coast we prefer the wild and beautiful bay of Palionisou where life seems to have stood still for a very long time. With the tender we will reach the 5-6 houses that make up the village, to stop to eat from Nicola, a charming experience of being in the middle of nowhere and eating an authentic but cheap meal in his small garden. Leros is an island still little known as a destination for international tourism and for this reason it is much loved by those looking for authenticity and tranquility away from mass tourism in the Greek islands. The bay of Pandeli is very attractive with its picturesque port dominated by 6 windmills on the west coast where we will sleep in the bay if the wind allows it. The bay is very pretty with white houses scattered around the bay. Leros has a lot of hidden beaches and bays. We will sail to the island of Lipsi after breakfast. Lipsi is a small group of islets near Patmos, which offers a number of anchorages and also a small, pretty port with many restaurants. There are a lot of tavernas, cafes and shops in the village. Small churches and monasteries scatter the island. We will swim in one of the many small islands in front of Lipsi. We will visit with the scooters the beaches of Platis or Giolos with crystal clear waters. We will cruise to Patmos in the early morning, with a breakfast and a stop for a swim in a bay around the island. It was here that St. John wrote the last book of the Holy Bible listening to the voice of God emerging from a rift in the rock and that is why Patmos is sometimes called “The Jerusalem of the Aegean”. The Monastery of San Giovanni dominates the capital. With the boat in the port of Skala, we could make excursions on the island by scooter or we can moor in the bays of the east coast to enjoy the beautiful spaigge. La Chora is a labyrinth of streets lined with souvenir shops, boutiques, art galleries and bars: already very narrow, during the day the narrow streets of the center are clogged by tourists on a daily visit. Patmos has a good number of beautiful equipped beaches and secluded bays, washed by crystal clear waters; add an elegant and discreet social life and you will understand why Patmos is a valid alternative to the most famous Greek islands … and expensive.